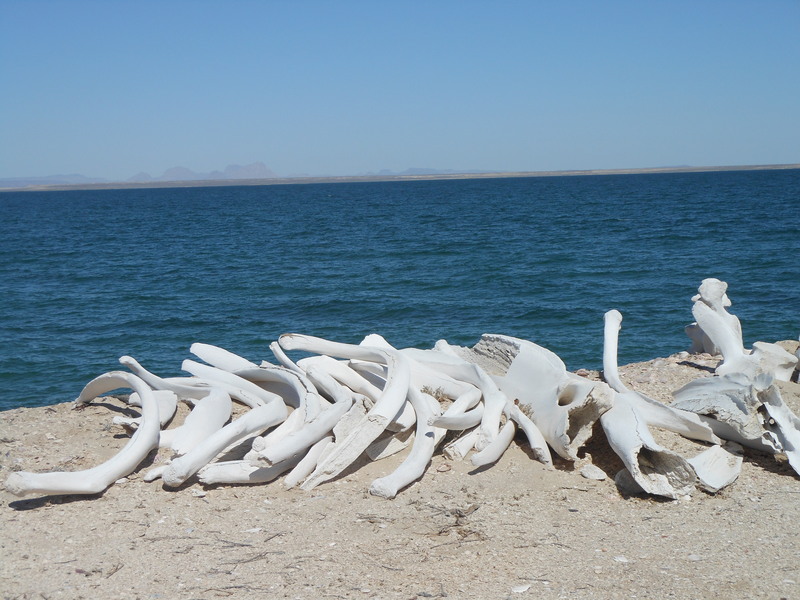 Ancient whale bones. Did they make it through Hurricane Odile? Looks like the Whale Camps around San Ignacio Lagoon will be in good shape for the upcoming arrival of the gray whale mothers and their babies in January. The hurricane battered the lovely paved road back to its previous “rough road” status. A 4-wheel drive is this year’s preferred vehicle, I think. Many people are working very hard to make sure it’s ready for January — April visitors . . . I’ll be there in March this year travelling with the Ocean Conservation Research folks and their fearless leader Michael Stocker. There might be a spot open for you, so contact Michael by writing to P.O. Box 559, Langunitas, CA 94938. On one of my first trips to whale camp, we endured the full 40 miles from San Ignacio town to La Laguna on an unpaved washboard of a road. The good thing besides rearranging your insides was that we stopped often to enjoy the desert landscape, the mesas, dunes, plants and cacti. At this point, I’m grateful that we will be able to get to San Ignacio and the whales at all. The local folks who live in the villages near La Laguna are making their way into town for supplies without too much inconvenience. I talked to Jose at Baja Expeditions and he says that everybody there knows all the shortcuts and back roads all around the area. And was there one little date palm tree that Odile spared in the town of San Ignacio? And what about the mission? I guess we’ll find out!